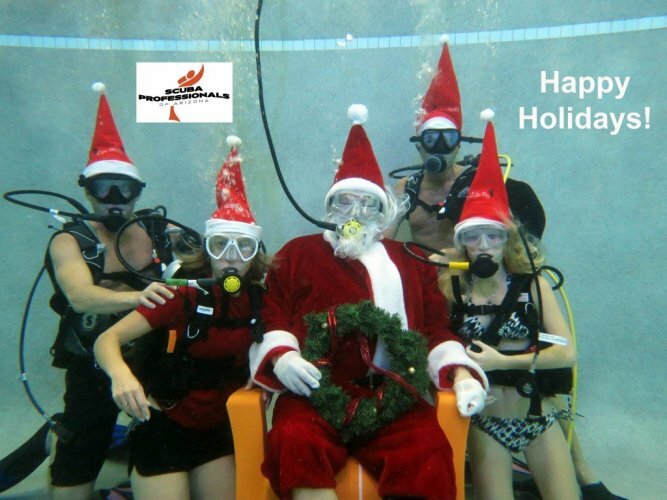 Scuba Santa is coming to Scuba Professionals of Arizona on Saturday, December 5! Fox Channel 10 broadcasted live to inform everyone about this fantastic event we call Scuba Santa Day! The video is a “behind the scenes” video from the live shoot! Scuba Santa Day is a yearly event. Yes, of course Santa comes every year! Santa jumps in to the pool and waits for you to join him, with your family and friends, and have the best Christmas picture ever – from the bottom of the pool! And here is the best part – it’s FREE of charge! We only ask you to bring 20 non-perishable food items that will all go to St. Mary’s Food bank. We put an honor in giving back to the community and always try to help those in need of help. We hope you can help us in this mission! Not only can you have your picture taken with Santa, we also have some spectacular savings on Scuba Classes, too good to miss out on! Read more here! You can read all about this years event here ! Call 602-314-6650 to reserve your spot!